Do you miss some traditional slot game action with chances to get your hands on some nice wins? If you wish to travel back in time with a class, you should take a look at Hot Seven Video Slot – a game filled with traditional symbols and great winning opportunities. This game offers you simple gameplay with excitement and no distraction. Hot Seven takes you to the roots of slot games and now we will guide you through this game. Hot Seven Video Slot is created by Austrian Amatic Industries. 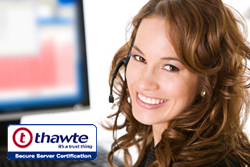 This provider was founded in 1993, years before the first online casinos were launched. Amatic Industries started to get a name in the industry after creating ground breaking multiplayer roulette games. This made them one of the best roulette game providers, but other than that they have also created some very nice slots cabinets and Video Slots. After online casinos started to become popular, Amatic decided to start to create games for online platforms instead of only focusing on games provided only to land-based casinos. Today, it has a vast selection of Video Slots, including various themes and fun features. They mainly create 5-reel slots, such as Hot Seven. In Amatic’s games, you will always see their unique handprint. It might not be the biggest provider in the industry, but has put together a convincing selection of games none the less. Now it is time to take a deeper look to one of the games in their selection: Hot Seven. Hot Seven offers you some blazing hot action on its reels. The backdrop of the game is burning red, to give you some warmth from the very beginning of the gameplay. Above the reels, you can see the flaming logo of the game and below them, there is the control panel from which you can set your bet and spin the reels. If you are familiar with the traditional slot games, the symbols of Hot Seven Video Slot might look familiar to you. They are variations of classic fruit symbols and few other traditional slot symbols. Lower paying symbols are cherries, lemons, oranges, and plums. Although, note that cherries will reward you with a win even if you get only 2 of those on an active payline. Watermelons and grapes will bring you bigger wins than other fruit symbols, but the top player of the game is the red hot seven. In addition to basic symbols, you will find a Scatter Symbol on the reels. This is a blue star and will bring you win even if it doesn’t land on the payline. 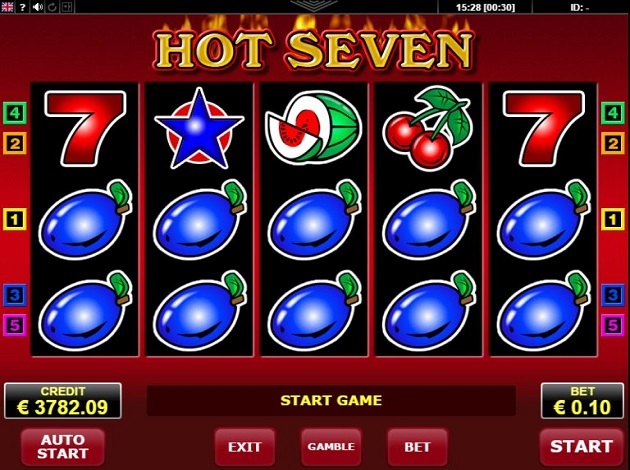 Hot Seven Video Slot is classic themed slot with some nice traditional slot game symbols on its reels. There are six different fruit symbols in this game to remind you of old days. If you haven’t heard the story how fruit symbols ended up on the reels of slots, you might find it interesting to know, that they were added to mark the flavours of the chewing gum you could win from them back in the days. Today, the wins are paid in cash, but the magic of fruit symbols haven’t vanished. Visually, Hot Seven gives you traditional feel on its reels. You will see drawn fruit symbols in many bright colours and clear designs. Sounds of the game are more modern than in the classic slot games, but nothing too new – the old-fashioned magic is there to be heard. Hot Seven is 5-reel and 3-row game with the possibility to activate 5 paylines. You will get to activate as many paylines as you wish, but keep in mind, that the wins are paid only when symbol combinations land on the active paylines. Betting is quite easy, just activate the amount of paylines you wish and set the bet per line and you are ready to spin. If you wish to see the wins you can get, just open the paytable and check the possible wins. Hot Seven is traditional video slot, so you don’t see any additional features in it. However, if you wish to find some bonus action on the reels, you might want to check out for example Red Hot Devil from Microgaming. This game is not that traditional, but everyone who likes burning theme, will like it. This game gives you as much fire as Hot Seven Video Slot, but also a chance to trigger the Bonus Game called Wheel of Fire. The Bonus is triggered when you get 3 or more flaming hearts on the reels. As you might have guessed by now, there is no Free Spins feature on the reels of Hot Seven Video Slot. The classical slot fans are not looking for this feature, but if you wish to get some Free Spins, you can try iSoftbet’s Super Fast Hot Hot Video Slot. This game gives you blazing hot theme with a possibility to trigger some Free Spins too. Land 2 diamonds on the first reel and get 2 Free Spins, during which the Wild and Diamond Symbols become sticky. Hot Seven is a traditional slot without that many special features, just basic excitement in form of reel spinning. However, you will have one special symbol to land on the reels: blue star, which is the Scatter Symbol of the game. This symbol will bring you wins every time you land at least 3 of them on the reels. This symbol doesn’t need to land on active payline to bring wins. Hot Seven has also gambling feature on its reels. Every time you get a win, you have a possibility to try to double it by guessing the colour of the playing card. If your guess is correct, your win is doubled. But remember, if you don’t get it right, you will get back to basic game empty handed. It is time to enjoy traditional gameplay on the reels of Hot Seven Video Slot. Are you ready for the hot action?